We have a commitment to evaluation because it’s important to us to have and share evidence that what we do makes a difference. We also regularly share our approach and insights through conference papers and presentations nationally and internationally. Most significant change reported by Connectors 100% – stronger connections, friendships and relationships among neighbours. 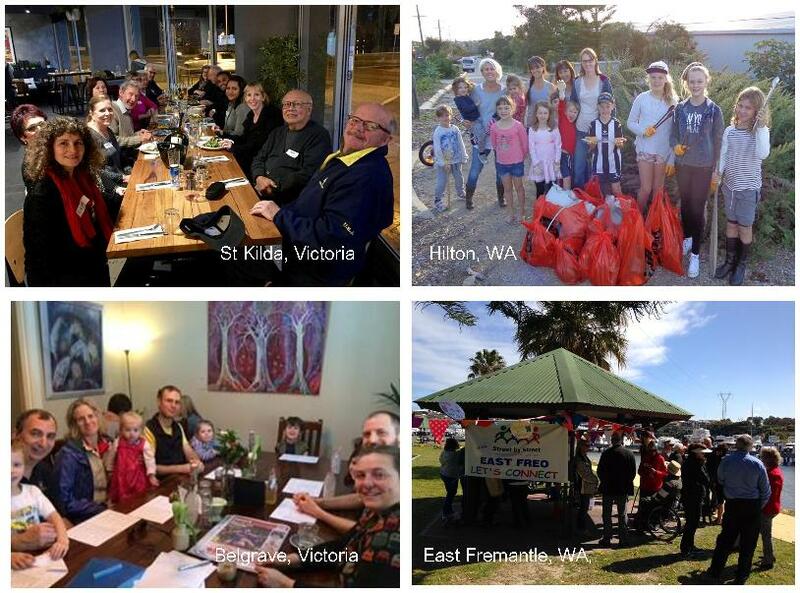 Neighbourhood Connect (formerly known as the Street by Street Project) has been helping people form neighbourhood groups since 2014. By the end of 2018 we have helped over 25 groups start. Structured interviews and surveys were undertaken with Connectors (leaders / organisers) of Neighbour Groups. Only groups initiated with our support that had been going more than six months and were active in 2018 were invited to participate. The interviews were conducted by phone and captured in survey forms in December 2018. 11 groups participated in the evaluation. Groups active during 2018 had between 6 and 165 members, with the number of people coming along to face-to-face events ranging from 6 to 70. Groups had between 1 and 6 Connectors, with Connectors much preferring not to do the role solo. In 2018, Neighbourhood Connect groups held over 130 events with over 400 participants and generated over 4,000 hours of real-life human connection. Where is the project being taken up? The majority of new neighbourhood groups have been in Victoria (59%), followed by Western Australia (26%). The vast majority are in urban areas. What has happened as a result of having a Neighbour Group? Sharing conversation and food at local restaurants, parks (barbecues) and homes. Most keep it simple (buy your own or bring a plate), others have progressive dinners and cake bake offs! Groups have larger activities from time to time, such as end of year celebrations, parties, outdoor movies and Easter egg hunts. Using the skills of local members, there is sometimes live music, face-painting, etc. A local art gallery put on a special event just for one group. Some groups improve the neighbourhood by having clean ups and then socialising over, for example, strawberries and champagne. Some garden and plant together. One group crowd-funded and improved their park. Others taking action on a local issue (noise, protecting a church square). One group adds an element of helping the disadvantaged by having everyone bring along coats, blankets or other things to donate to charity. A couple members of one group have held open days for their handmade products and neighbours have gone along to support them. Some groups have organised walks (with or without dogs), Zumba classes or aqua aerobics so neighbours can exercise together. The email list or Facebook group is used for sharing and asking for help or recommendations. One group has it’s own choir and has held a pop-up street market. Neighbours go together for live music, talks, trivia, wineries, shows and movies. Neighbours watch out for one another and keep an eye on each other’s property. Evaluation indicates that Neighbourhood Connect groups result in people being happier and more supported. What’s the most significant change that has come about as a result of your neighbour group? 100% of Connectors said that the most significant change has been the stronger connections and friendships among neighbours. Helping 27% help a neighbour weekly, 55% monthly and 18% every few months. 18% receive help weekly, 36% receive help monthly and 45% every few months. The Connector’s average score on satisfaction with feeling part of the community was 7.8, which compares favourably with the result of 6.63 from the nationwide HILDA study in 2013[i] and 6.75 in data from sixty four Melbourne Metropolitan Councils in 2018[ii]. 55% of Connectors chat with their neighbours often. Before starting a neighbour group, Connectors knew an average of 10 neighbours (range 1-40) and they now know an average of 35 (range 8-90). Importantly, they have made an average of four new friends each. 64% have greater trust in their neighbours since starting a neighbour group. The Connector’s average score on life satisfaction was 8.7, which compares favourable with 7.6 from the Australian Bureau of Statistics General Social Survey[iii] and 7.9 from the HILDA study[iv]. 91% reported that since starting their neighbour group they are happier and have greater wellbeing. 55% report greater awareness of local issues and 64% report greater involvement in local issues compared to before they started a neighbour group. 27% now use local businesses and services more. Of those who experience loneliness, 60% experience less since starting a neighbour group. While 17% of Australians in the HILDA study often felt lonely[v], none of the Connectors felt this. 27% help a neighbour weekly, 55% monthly and 18% every few months. 18% receive help from a neighbour weekly, 36% receive help monthly and 45 % every few months. While 9.5% of Australians lack social support[vi], none of the Connectors lacked social support. What are the good things that have come out of it for Connectors? Meeting great people and increasing connections, community and friendships are the main things Connectors gain from leading a neighbour group. Getting help when you need it is also an important outcome. Connectors find it satisfying to make things happen in their neighbourhood and enjoy the appreciation from neighbours. Would Connectors have gone ahead without the support from Neighbourhood Connect? 64% of Connectors said that they would not have brought their neighbours together and started a neighbour group if they hadn’t received support from Neighbourhood Connect. [i] The Household, Income and Labour Dynamics in Australia (HILDA) Survey is a nationally representative longitudinal study of Australian households, which commenced in 2001. It is run by the Melbourne Institute of Applied Economic and Social Research at the University of Melbourne. This data is drawn from in the following report: Reeve, R., Marjolin, A., Muir, K., Powell, A., Hannigan, N., Ramia, I. and Etuk, L. (Eds.) (2016) Australia’s Social Pulse. 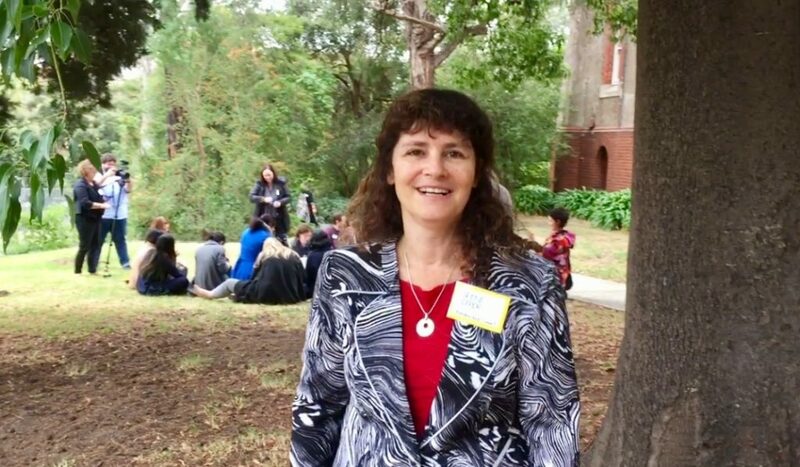 Centre for Social Impact: UNSW Australia, Sydney and UWA, Perth. [iv] Reeve, R., Marjolin, A., Muir, K., Powell, A., Hannigan, N., Ramia, I. and Etuk, L. (Eds.) (2016) Australia’s Social Pulse. Centre for Social Impact: UNSW Australia, Sydney and UWA, Perth. Keynote Presentation, Asset Based Community Development Conference in Goa, India, January 2019. Presentation, Power to the People Conference, Melbourne, December 5-6, 2017.